Mactan Cebu International Airport is already one of the country’s more decent airports, aging infrastructure notwithstanding. But, unlike its Manila counterpart, which is bursting at the seams from overcapacity, the Cebuanos met their growing tourism numbers head-on with a world-class upgrade, courtesy of the winning bid from Philippine Megawide Construction Corporation and Indian company GMR Infrastructure, who now handles the operation and maintenance of the international airport. The Mactan Cebu International Airport and GMR–Megawide Cebu Airport Corporation wasted no time and started working with a powerhouse team of collaborators for a new international terminal, with Integrated Design Architects, Inc. (IDA) of Hong Kong helming the design with renowned Filipino firm BUDJI+ROYAL (who will be helming the renovation of MCIA Terminal 1) and internationally renowned Cebuano furniture designer Kenneth Cobonpue among others. The approach to the airport is presaged by an ETFA roofed link bridge that brings in sun and keeps out rain. The flexible ETFA cushions and foils are tear and chemical resistant. 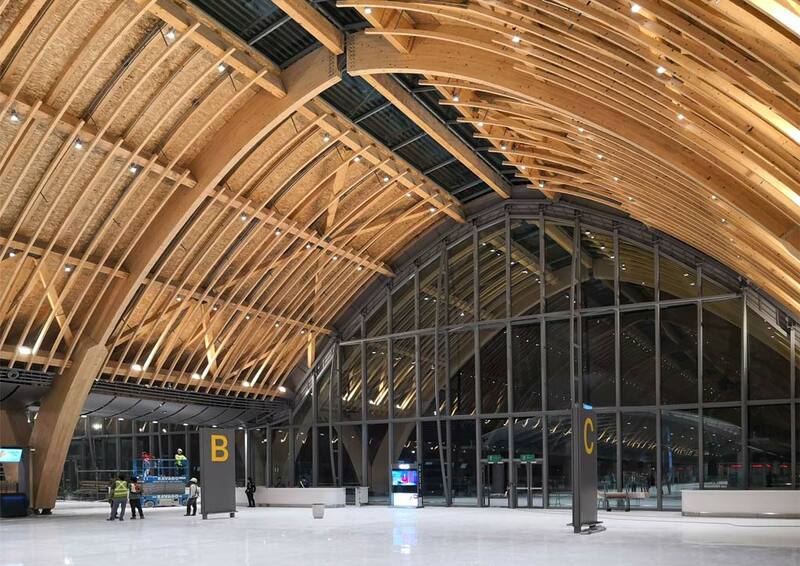 The 30 meter wide, 18 meters high arched columns holding the sloping roofs are made of glulam or ‘glued laminated timber.’ This material is stronger than steel and more resistant to moisture. Glulam used for the airport came all the way from Austria, courtesy of Rubner Holzbau, the supplier’s largest ever order for the material. The warm white lighting of Signify’s LED lighting system for the departure area complements the natural hues and textures of the glulam arches. Signify used a grand total of 8,000 LED lightpoints throughout the airport, and is an all-LED structure. With the system in place, Signify country manager Jagan Srinivasan says that with a total energy consumption of 282KW, the airport will only spend roughly 10 Million PHP a year on lighting costs. Airport counters get the DEDON treatment (who has both a factory and a resort in Cebu) with an intricate weave applique, lit up in various colors. The largest Duty Free shopping area in the country will open at the airport, marked by a swirling, wavelike ceiling treatment that is consistent with the beach theme of the world’s first ‘resort’ airport. Cebuano staples like lechon will be making an appearance alongside established global brands and local outlets. The rest of the terminal’s ceiling get what looks like a louvered wood slat treatment, only, the slats are actually metal painted to look like wood. These slats slide on their mounts and can be reconfigured, fixed or removed when needed. The lavatories are outfitted with a moss wall that aids in air purification. The Mactan Cebu International Airport Terminal 2 is slated to open to international air traffic on July 1, 2018 after four years of construction. The public however is given a chance to view the airport before the opening from June 27 to 28, 9am to 5pm. Just bring a valid government ID to enter!